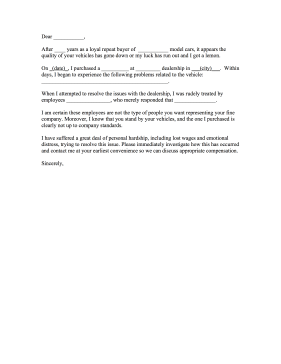 Intended for unhappy customers of new and used car dealership, this complaint letter requests action and compensation for a bad vehicle. After ____ years as a loyal repeat buyer of ___________ model cars, it appears the quality of your vehicles has gone down or my luck has run out and I got a lemon. On _(date)_, I purchased a __________ at _________ dealership in ___(city)___. Within days, I began to experience the following problems related to the vehicle: ______________________________________________. When I attempted to resolve the issues with the dealership, I was rudely treated by employees ________________, who merely responded that _______________. I am certain these employees are not the type of people you want representing your fine company. Moreover, I know that you stand by your vehicles, and the one I purchased is clearly not up to company standards. I have suffered a great deal of personal hardship, including lost wages and emotional distress, trying to resolve this issue. Please immediately investigate how this has occurred and contact me at your earliest convenience so we can discuss appropriate compensation.